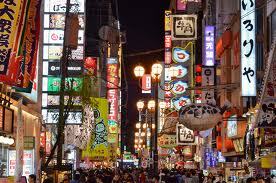 OSAKA, Japan – Arriving at the Kansai Airport in Osaka yesterday I no sooner got through customs and out into the airport hall where I sought a cash machine when a television crew of three people approached me from behind and asked if I could speak to them about why I was in Japan. Was it my guitar case that attracted them? And the fact that I was clearly not Japanese? I had noticed them momentarily before, as I approached the ATM, and they were speaking to another foreigner – whom I assumed was a big star I could not recognize. So I was not totally taken by surprise. I was fairly tired after playing in Tony’s Aussie bar in Seoul the night before, and this seemed like good fun to be interviewed by two Japanese journalists behind a TV camera, that it would help give me the electric voltage I needed to snap a bit more life into me, so I decided to play along and really got into it. Well, all except the fact that I did not really want to get into the details of my day job, and basically just emphasized the fact that I came to Japan to play in open mics and jam sessions, in addition to attending the Formula One race! But then I realized this must really be Japanese television when they asked me if I could play a song for them there, right there, in the airport front hall of the terminal. I immediately saw my opportunity for marking my territory in Japan in the most unusual of places, and not having to wait to find an open mic! So I whipped out the guitar and started playing my song, “Crazy Lady,” for the camera. At some point – I think right after the song – I turned around to notice that one or two members of a Formula One team whom I know and who had been on the same flight with me and just got off, were filming me being filmed and playing my music for the Japanese TV people! Talk about a reversal of roles! I’m supposed to be doing stuff on the F1 people, not the other way around. But they were greatly amused, and in any case, I’d already jammed with that team in Singapore one night a couple of years ago after the race, so they knew about my musical adventure…. After speaking to the TV people, I had to sign a release form to say it was OK for them to use the footage if they wanted to. But I have no idea what channel it was, or whether it will make it to broadcast or not. What I do know is that it may have been a world-turned-upside-down experience from the moment I stepped off the plane into Japan, but it was only the first part of a loopy tale of Lost in Translation. I checked into my hotel and did a bit of work or something else, and then I set off for a bar that seemed to specialize in holding open mics. 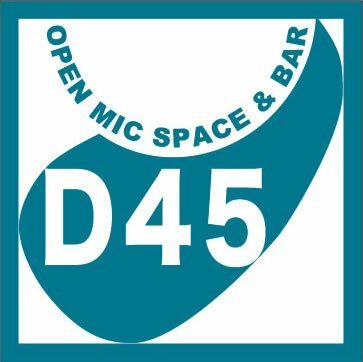 In fact, the bar is called: “Open Mic Space D45.” I found their page on Facebook, and from there I used the translator and saw that they had posted that yesterday it was an open mic all day long at the venue. So knowing full well that any forays into the complicated world of a big Japanese city looking for an obscure address was inviting terror and confusion and certain defeat – for a foreigner who visits the country only for one short period per year – I decided nevertheless that I was here in this life in order to do such things, and I set off. But finally, when my iPhone did go dead – and I prayed I’d find my way back to the metro without it- I found myself standing in front of a Japanese/French restaurant, right next to where the open mic was supposed to be. And in there, I met a Japanese woman who was friends with the owner, and she spoke English because, naturally, she had once lived in Canada. 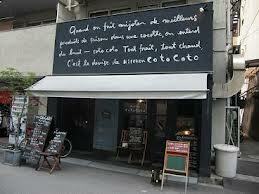 So she asked, and no one knew of any music joint in the vicinity. So I decided that it did not matter, I’d already played for Japanese television at the Kansai Airport, and I’d marked my territory. So I settled down for an excellent French-Japanese meal at “Kitchen Coto Coto,” some nice French wine and one of the best creme caramels I’ve ever had, outside Africa. (I’ll tell you more about that some other time.) And the woman who had worked in Canada opened up a notebook she had, in which she had drawn a map of France, and marked off dozens of the names and locations of great French cheeses – which she loves…as do I…. PS, I’ll see if I can get that video from the F1 team for posting here in the next few days….